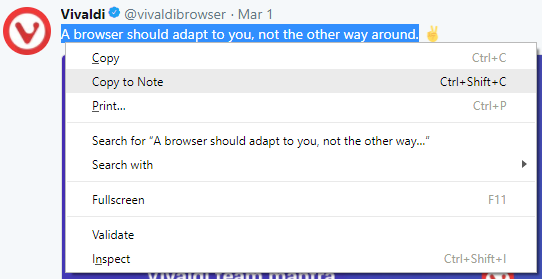 Take Notes, adding a description and even screenshots to the notes while surfing the web with Vivaldi browser. Add your thoughts and ideas to any sites you visit using Vivaldi Notes. Where can I find my Notes? Find and edit your notes from the Notes Panel located on the side. You can also use keyboard shortcuts (Ctrl+Shift+O / ⌥+⌘+N by default). How to manage my notes? Delete a note or folder. Once a note is deleted, you can find it in the Trash folder. How do I restore a note from the Trash? Drag the note out of the Trash and place it anywhere above. How to empty the note Trash? 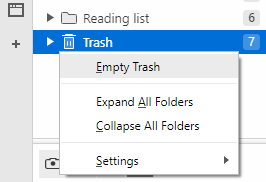 Right-click the Trash and select Empty trash. Use markdown formatting to make your notes more readable and interesting. Search notes using the search field on the top of the Notes Panel. Add a note by marking text on a webpage and selecting Copy to note from contextual menu. The note will be added with the marked text as body and the webpage URL in the Address field.